The top organization allegedly protecting America's magnificent natural heritage and vital resources does nothing of the kind. The Sierra Club has evolved from being a nonpartisan defender of US land, water and wildlife to being left-wing globalists in plaid shirts and hiking boots, crippled by a failed ideology of progressive utopianism and a leadership increasingly corrupted by money and power. That's bad news for our planetary home, which needs all the help it can get right now. Even if you discount the idea of climate change, the problems of pollution and resource overuse are becoming extreme. The Great Pacific Garbage Patch is particularly repellant. It's a noxious floating stew of mostly plastic trash that has accumulated somewhere between California and Hawaii, is twice the size of Texas and weighs 3.5 million tons. There's so much that cleaning it up "isn't an option"
Improved technology has spawned a level of environmental destruction unimaginable just a few decades ago. Thus factory fishing has caused the collapse of Newfoundland's Grand Banks off Canada's east coast, once the richest fishing grounds on earth. Now the cod have been wiped out with no sign of when, if ever, they will return. But Establishment environmental awareness is oddly selective nowadays. There's hyper-concern with climate change in the media. But there's almost no attention given to other issues that are more immediate, e.g. the loss of a fishery that was a major food source. As a result of ignoring the central issue of overpopulation, both global and domestic, the Sierra Club has painted itself into an intellectual corner: It advocates ever-stricter controls on consumption—but increased population growth quickly wipes out any advantage gained by reducing resource consumption. The Sierra Club favors an expanded nanny state to cope with rapidly expanding population and its effects. But, as author Isaac Asimov remarked, "Democracy cannot survive overpopulation... The more people there are the less one individual matters." Sierra Club Executive Director Carl Pope recently bragged on his blog about his recent trip to India, which included dispensing a cash prize—a new annual award of $100,000 to be given to an Indian organization creating green livelihoods. The Sierra Club is developing its own foreign policy. Pope is spreading money around like some Chicago ward politician looking for votes and influence. That comparison is all too inappropriate. Recent actions from the Sierra Club's home office show a disturbing uptick in Pope's pursuit of power by suppressing democracy within the organization. The Sierra Club has a membership of 1.3 million. Most are not engaged in its internal politics. They participate in the organization's many activities, ranging from hikes and local habitat restoration to political action. The Arizona Chapter has people getting active on right-of-way laws, the Arizona Game and Fish Commission, and many extremely boring legislative issues, but nothing at all about the biggest threat to Arizona's environment. There is a yearly Board election where one-third of the 15 Directors are chosen. It has been a point of pride that the Sierra Club is a rare non-profit organization that has some degree of membership influence—at least on paper. Pope and his management cronies have moved to consolidate power in several instances. Even "establishment types were horrified" at Pope's arrogance, according to one plugged-in member. Project Renewal was launched in February to replace local committees with management-chosen activists who are presumably good at doing what they're told. [PDF]Such a basic restructure of power violates the whole foundation upon which many hard-working volunteers have participated for years. At recent count, 26 chapters had voted against Project Renewal. Last fall, the Sierra Club joined with Pacific Gas and Electric (which supplies power to much of northern California) to distribute compact fluorescent light bulbs. P, G, and E's motive was to look good to California regulators, who will pay it a bonus if it cuts consumer energy consumption. [Utilities Amp Up Push To Slash Energy Use, Wall Street Journal, By Rebecca Smith, January 9, 2008] The bulbs do save energy, but disposing of old ones is environmentally problematic because of their mercury content. Again, the national leadership took this action on its own with no input from local chapters. The Sierra Club agreed to endorse Clorox's new Green Works cleaning products—for an undisclosed sum. This is the first product endorsement ever in the Club's history.
" 'I won't pretend it's not internally controversial; it is. But we decided it was more important to try to create this marketplace' than to keep the peace. "The major task, he said, was ensuring that the products' ingredients met the Sierra Club's requirements for being called 'natural', a term that has no federally approved definition when it comes to cleaning products." There is big money for product endorsements in today's green marketplace. In March, the Audubon Society signed a deal with Toyota worth $20 million to "fund conservation projects". "[Hedge fund entrepreneur] David Gelbaum insisted that he played no role in the election. He dismissed allegations that he is calling the shots at the club in any other way. "Gelbaum, who reads the Spanish-language newspaper La Opinión and is married to a Mexican American, said his views on immigration were shaped long ago by his grandfather, Abraham, a watchmaker who had come to America to escape persecution of Jews in Ukraine before World War I. After putting the atavistic anti-American impulses of a wealthy plutocrat above America's environment, the Sierra Club received over $100 million from him. To protect the secret as they pursued more money, Pope and his henchmen accused insurgents of being racists for advocating the same position that had been the Club's official policy in 1989: "Immigration to the U.S. should be no greater than that which will permit achievement of population stabilization in the U.S."
So the Clorox arrangement had its precedent. What's the big deal about a little product endorsement when Sierra management has already demonstrated it can be bought? Show Carl the money! Sierra will receive a portion of the sales from the new Clorox products, called Green Works and made from mostly plant-based ingredients. "In addition, the Sierra executive director sent a letter to activists saying the Green Works cleaners 'have been vetted by' the group's Toxics committee, suggesting official approval was given. "However, Jessica Frohman, who chairs the Toxics committee, said it did not officially sign off on the products. 'I don't want people to think we approved this when we did not,' she said. "After the Floridians' removal, leaders of other state Sierra chapters got a letter from national president Robert Cox [Email him] warning them not to 'seek public media coverage' of the fight using the group's name." The Scots immigrant John Muir founded the Sierra Club in 1892 with other friends of wilderness "to make the mountains glad." 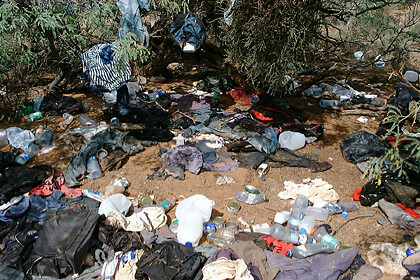 Sadly, today's Sierra Club is welcoming foreigners who have no such love of nature, but show their disdain for America and its natural heritage by despoiling the border areas with piles of garbage as they enter illegally from California to Texas. John Muir would be disgusted by what the Sierra Club has become. Brenda Walker (email her) lives in Northern California and publishes two websites, LimitsToGrowth.org and ImmigrationsHumanCost.org. Her Sierra Club membership is currently in self-imposed suspended animation.